If you’re in the market for replacement windows for your home in Nixa, Missouri, there is no better company to turn to than ABC Seamless Siding & Windows. 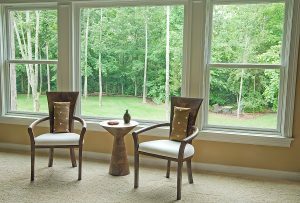 We offer two lines of replacement windows so that we can accommodate various budgets. No matter which windows you choose, however, you can be sure they will be ENERGY STAR® rated and will contribute to improved energy efficiency for your home by reducing thermal transfer through the windows. This can make it easier for your HVAC system to regulate the temperature, which can even lead to reduced monthly energy costs. Our replacement windows are so energy efficient because they are equipped with features such as double- or triple-paned Low E glass, argon gas fills between the panes, and thick vinyl frames that have optional insulating foam fillings. Plus, the vinyl frames have numerous benefits over frames made of other materials such as wood. Vinyl is exceptionally low maintenance, because it only needs to be wiped down with soapy water to look like new again, instead of requiring sanding and repainting. Our vinyl frames are also incredibly durable, and will not crack, warp, rot, or peel. Furthermore, our windows are backed by a lifetime warranty, so you can rest easy knowing that your investment is well protected. To learn more about the replacement windows we install for homeowners in Nixa, MO, contact ABC Seamless Siding & Windows today.